I understand that my membership to A Cup of Content is year-to-year with no long term commitments. I authorize A Cup of Content (Content a la mode, LLC) to charge me $189 USD each year until I cancel my membership. If I cancel my membership, I understand that I may not be eligible for this pricing if I renew in the future. I understand that when I cancel my membership, I will continue to have full access to the membership, Facebook group, and community until my membership has expired (the date I would have been charged for the following year). Furthermore, I affirm that the name and information I provided on this form are true and accurate. 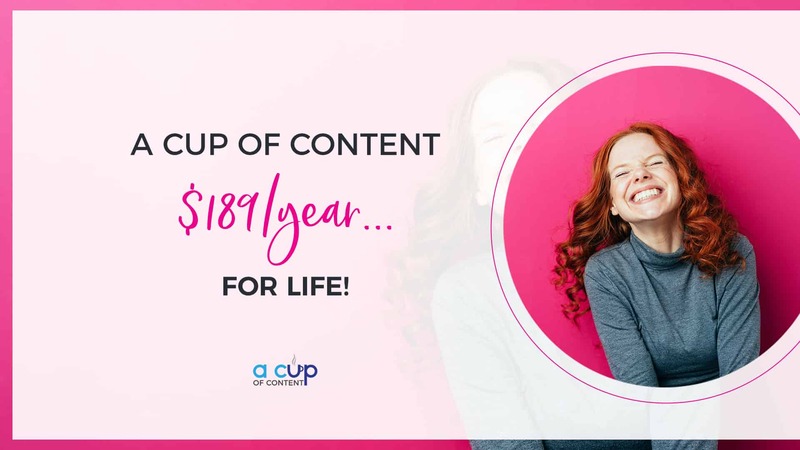 By subscribing to the $189/year Membership, I agree that I have read, understand, and accept A Cup of Content's terms and policies as published on their website (as linked below). I also understand that there is NO refund policy for this membership and that NO refunds will be processed.